Hi all! Welcome back for the second day of this clear stamp release over at Some Odd Girl...today I can't wait to show you Daisy Mae! Is she not just so much fun? Such a complete blast to color and perfect for so many different occasions. Again I went the clean and simple route letting the image, with that stunning yellow dress, just pop right off the card! 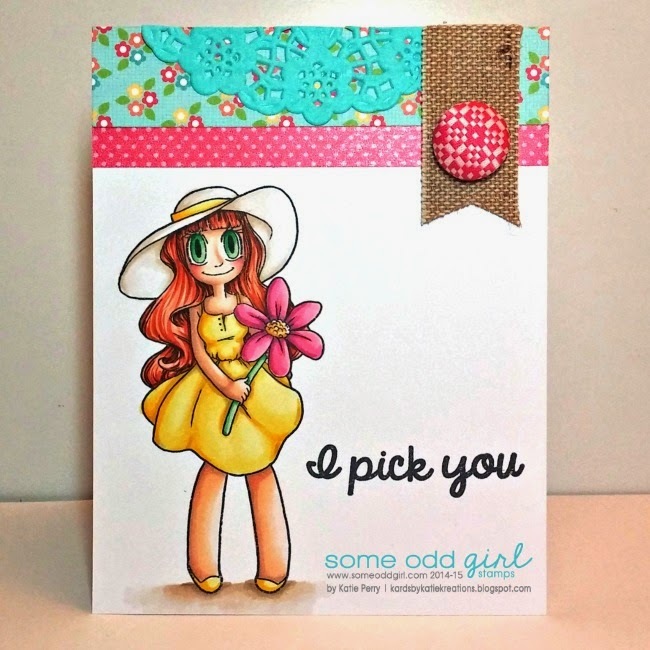 Now, make sure to hop on by the Some Odd Girl blog for some more inspiration- they'll knock you socks off- and pop on into the shop to pick up Daisy Mae for yourself! Thanks so much for stopping in to visit- hope you've enjoyed! Love this Katie. A gorgeous image and design. Beautiful card girl- love that dress!